Whether it's because you left the keys in the ignition, the lights on, or your battery is just old, sooner or later every car owner will be faced with a dead battery. Fortunately for you, if there is another functional car nearby, or if you have a manual transmission, you can jump start the car and be back on the road in no time! The first thing you need to do is make sure the battery is the problem! Check the headlights - are the dim or bright? If they are dim, than your battery is the culprit but if they are bright, you do not have a dead battery and unfortunately, a jump start will not help you. Now, open the hood on each car and locate the battery. If you are unsure, look at your owner's manual for the location of the battery, and identify the positive and negative terminals. The positive terminal will be marked with a plus sign (+) and will usually be attached to a red cable. The negative terminal will be marked with a minus sign (-) and will usually be attached to a black cable. Park the working car near the disabled car, in such a way that the distance between both car batteries is as small as is safe. Turn off all electronic components in both cars. Do not let the cars touch. Inspect the battery for cracks, leaks or other damage. If you find any, do not jump start the car. Call a tow truck instead. Untangle and unwind your jumper cables. Like your battery, they will be red and black. These cables will have heavy clamps to connect to the battery terminals. 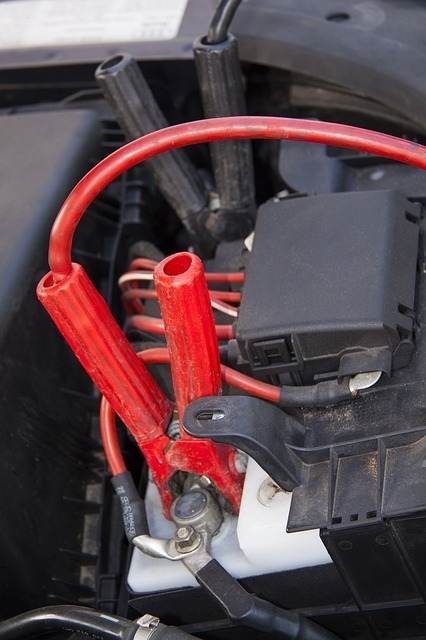 You must make sure that the ends of the jumper cables never touch each other, as this can result in serious arcing and damage to one or both cars. Connect the jumper cables in the order described below. Connect the other black clamp to a piece of grounded metal on the dead car, preferably the bolt where the thick negative cable from the battery connects to the chassis. If this is not feasible, look for shiny (not painted or oily) metal that is attached to the engine. Usually a nut, bolt, or other protruding piece of shiny metal will work. You may see a small spark when you connect to a good ground. Start the Working Car. Let it idle for a few minutes. Do not race the engine, but of rev it above idle for 30 to 60 seconds. You do this to charge the dead battery. If 30 seconds does not work, try keeping the engine at a high idle for the full 60 seconds. Try to start the disabled vehicle. If it does not start, shut the engine off and disconnect the last connection temporarily while you slightly twist or wiggle each of the four clamps to ensure a good electrical connection. Allow another 5 minutes for charging before attempting to start the disabled vehicle again. If it does not work after a few tries, you may need to have the car towed and the battery replaced. Remove the jumper cables once the car stars. Do this in the reverse order to which they were attached, and do not let any of the cables or clamps touch each other or dangle into the engine compartment. Disconnect the black clamp from the grounded metal. Disconnect the red clamp from the positive(+) terminal of the good battery. Replace any positive (+) red post protective covers if necessary. Keep the recently-disabled car's engine running with your foot on the gas for 5 minutes, and then leave it to sit in idle for 20 minutes before turning it off. This should give the battery enough charge to start the vehicle again.